Secrets make you sick...and silence is the enemy of healing. Do you have any secrets? 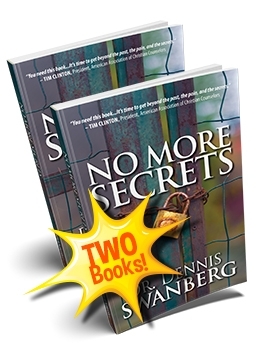 It’s time to look at secrets and their power to either hinder or heal. We have secrets because we like to live behind a mask, a facade or a veneer. It is a great mercy that God does not leave us in our secrets. He will not let us hide. His grace finds us. His mercy forgives us. His love covers us. "This book is engaging, inspirational and truth. I have said often, 'what we drag out of the dark into the light, has no more power over us.' Jesus said, 'you will know the truth ad the truth will set you free.' But pouring the truth out into the open is one of the hardest things to do in life. I am proud of Dennis. He has been my friend for over a decade and his willingness to be open vulnerable in this book is life changing."